Preheat the oven to 160 °C (fan) / 180 °C / 350 °F and line baking sheet with greaseproof paper. Mix peanut butter, sugar, and egg in a large bowl until you have a smooth dough. Mash up figs in a small bowl. Add a little citrus if you’ve got some to make it a tad more tart. Roll the dough in to roughly tablespoon-sized balls and place on baking sheet. They won’t spread too much since there’s very little fat in them, but do leave a little space for spreading. Flatten slightly with a thumbprint, so that you have an indentation for the fig mixture. Place a little fig mixture in the center of each cookie. Don’t overfill it since it will spread a little bit, and too much wet fig can prevent the cookie from cooking properly. Place in center rack of oven and bake for 10-15 minutes. 13 minutes was perfect for me. The edges will be a little brown when they’re done, but the dough will still feel very soft when they first come out of the oven. Let them cool on the tray for about 5 minutes and then transfer to a wire rack to cool until they’ve firmed up a bit. Update 7/10/14 – Whoa, these go really squidgy after a couple days. 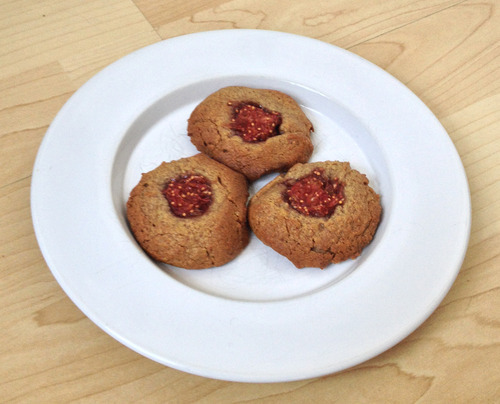 The regular peanut butter cookie recipe doesn’t, it must just be the moisture from the fig. Still really like them, but it’s a good thing the fig wasn’t more wet.